Industry got an early start on Antietam Creek. Its first settler, Israel Friend, built a gristmill there by the early 1730s. Friend also owned an Orebank, which was purchased along with a tract of land by John Semple. 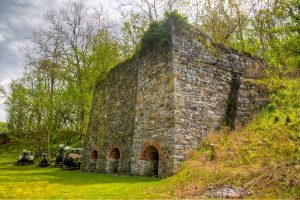 Semple’s intent was to build a furnace for his ironworks farther down the Potomac. One problem—he was at odds with another group that was building an ironworks operation and had much more forested land which was necessary for the furnaces. As a compromise, Semple agreed to provide 300 tons of pig iron a year from his Orebank to the local Frederick Forge. Semple couldn’t uphold his end of the bargain and was imprisoned. Frederick Forge became known as Antietam Ironworks and was acquired by John McPherson in 1806—managed ably by John Brien. Brien’s son succeeded him in 1834. At one point, the ironworks was said to employ more than 260 workers (including 60 slaves). Multiple waterwheels of different sizes drove the bellows, a 21-ton forge hammer, nail factory, sawmill, rolling mill, and flour mill. The Ironworks switched hands again after Brien’s death in 1849. Operations were interrupted during the Civil War, then the property was acquired again by two brothers who owned several ironworks in Pennsylvania and used the Cumberland Valley Railroad to connect them. Their own railroad venture, the Harrisburg & Potomac, never reached its southern terminus. The 1877 flood inflicted extensive damage on the ironworks. It finally closed in 1880. Access Point - Footbridge to Canal Rd.